While Dalmatia is justifiably famous for its fabulous coastline and stunning islands, it is a destination which is deceptively rich in heritage and unique traditions, and the region has plenty to offer visitors looking for more than a standard sun and beach holiday.Among the most fascinating is the annual ‘Za Krizem’ Easter procession on the island of Hvar, a religious procession which has taken place uninterrupted (despite the region’s turbulent history) for more than 500 years, included a procession in the Egyptian desert during the Second World War. As the name suggests, the ‘Behind the Cross‘ procession follows a single cross-bearer through the night on Maundy Thursday, a journey of some 22km via five other churches, before returning to the starting point at around 7am on the morning of Good Friday. The cross bearer is assisted by his acolytes, clad in white robes and carrying torchlit lanterns through the night, while singing their haunting religious chants without interruption. Behind the acolytes comes the congregation and visiting tourists, who are becoming increasingly attracted to arguably the world’s most unique religious procession. The procession has been internationally recognised and was granted UNESCO heritage status in 2009. Each village on Hvar has its own procession, and they take place at different times during the week (see the Jelsa Tourist Board for more information), but the main event is the simultaneous processions of the communities of Jelsa, Pitve, Vrisnik, Svirce, Vrbanj and Vrboska, who all set off at 10pm on Maundy Thursday, moving slowly in the same direction. As they approach the next village on the route, they visit the church to pray, before proceeding on to the next location. The cross bearer, traditionally barefoot, carries the cross the whole way, a cross weighing between 10 and 18kg, and one which is several hundred years old and full of history. The main procession is that of Jelsa, and the faithful make their way slowly to the main square on Good Friday morning, where the exhausted cross bearer runs the final steps before delivering the cross to the priest. Although the procession has taken place every year since 1510, there have been occasions when it was under threat, most notably during the Second World War. 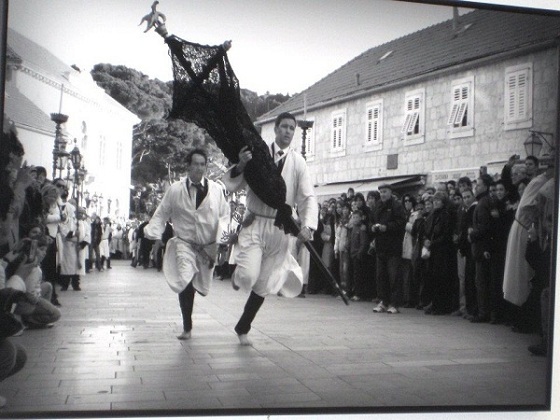 The photograph above, which was exhibited at a festival in Svirce last year, shows the 1943 procession in the village. 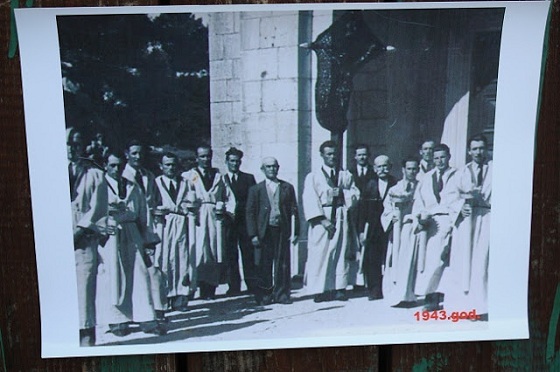 During that year, the occupying Italians banned the local people from taking part, and would only allow the cross-bearer and acolytes in the picture. 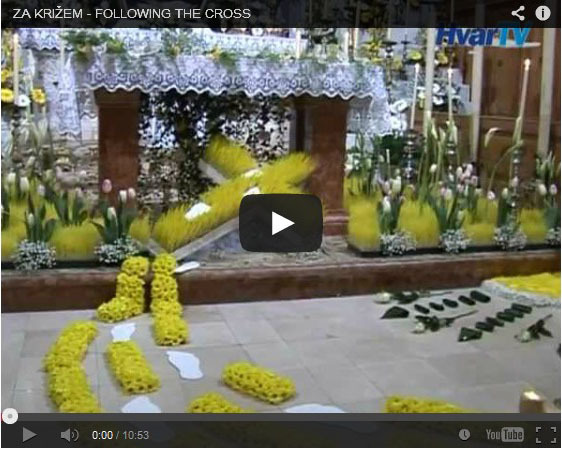 More interestingly, the procession has also taken place in the Sinai Desert in Egypt at a refugee camp in El Shatt, as more than 25,000 people from Dalmatia, including more than 3,000 from Hvar, were evacuated to Egypt. Many people on Hvar today were born in that refugee camp. Carrying the cross is a huge honour and one which people sign up for up to 20 years in advance. In an interview with Hvar TV (see below), 2012 Pitve cross bearer Ivo ‘Mafija’ Mileta explains the relationship with his acolytes, the prestige of carrying a cross his grandfather and great-grandfather carried before him, and the role of various parts of the community in the whole event. Tourists are more than welcome to take part in the procession, and many do. Some choose to walk the whole route, while others choose to spend the night in one of the squares, such as the main one in Jelsa, watching the various processions arrive and depart. Some cafes remain open all night. Another interesting vantage point is inside the churches themselves. For those wanting to take part in the procession, take plenty of water, as well as a snack for sustenance. Much of the walk is along hilly paths, so bring appropriate footwear. Clapping as the procession passes and ends (as happened in Jelsa last year) is not encouraged, as this is first and foremost a religious festival. One other additional attraction to the event is that all residents leave their lights on through the night, so the six settlements are bathed in light, while the cross bearer’s house has an illuminated cross outside for the days leading up to the procession. 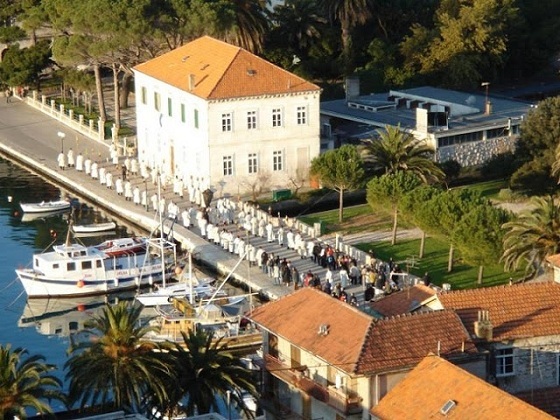 The Easter procession is the undoubted highlight of an Easter visit to Hvar, but it is also one of the best times of year to visit the lavender island, a time when the local community comes out of winter hibernation and prepares for the season, and a time of family joy as extended family congregate for this important religious festival. 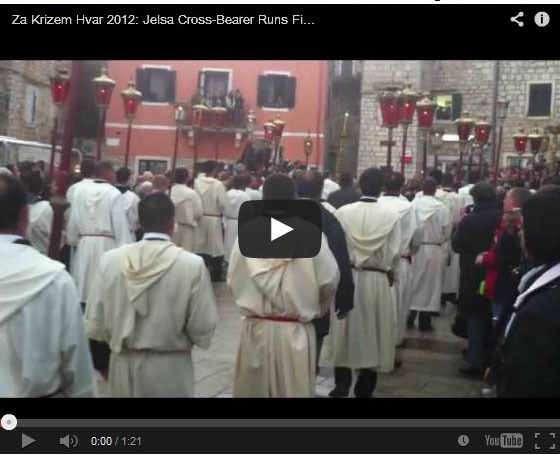 For more information about Jelsa and the Easter Procession, visit the Jelsa Tourist Board website.